The social and economic progress of the rural populace is a major focus area for the Integral Village Development Programme. Establishing a progressive social model where each individual of the village becomes an essential, connected and contributing part of a collaborative community is the overall theme of the initiative. This also necessitates that the economic conditions of the people in the villages are improved and stabilized, both by increasing the avenues of income generation and by instituting effective practice of saving. The Village Development Programme has encouraged individuals to be self-employed and self-reliant, by providing a variety of alternative rural career options, such as dairy units, tailoring, carpentry, etc. This has been successful in inspiring other people to take up such activities. The Programme has also helped in the successful implementation of the National Rural Job Employment Guarantee scheme of the government in the villages, ensuring 100 days of compulsory employment, and thus income, especially for the aged and women. In collaboration with several self-help group (SHG) leaders, the Programme has initiated a Community Revolving Fund for SHG and non-SHG members which covers covers more than 700 women in the villages. Working with SHGs: Sarvam has revived 13 existing SHGs and promoted 7 additional ones. . It has helped encourage women into small business ventures such as dairy units successfully tying into the local Pondicherry (PONLAIT) milk program. The Programme also advances loans for micro-enterprises to encourage self-employment. The initiative of integral development of rural life has had a phenomenal impact on women, with a deep transformation of their attitude towards themselves and towards the community. In a true spirit of self-awareness and empowerment, village women have learned to look at life beyond the rigid confinement of domestic boundaries, typical to most rural Indian women. They have realized the potential of their individual contributions to the family and to the community at large. Income-generation schemes for women including small businesses, such as tailoring units, personal saving practices and common funds have been initiated, wherein the women contribute actively and independently. They organize and participate in various community activities and also contribute to the expenses from their own savings or from the common fund. They are aware of the government schemes available for them and can now make effective utilization of these opportunities. They are conscious about their own health and that of their family, and are also keenly involved in the education and well-being of their children. They also contribute to the community mission of green and clean environment by cultivating kitchen gardens and maintaining hygienic conditions at their homes and surroundings. Loans: The repayment rate is still at 100%, an unheard figure in the lending world. These have been used to help establish successful women’s economic activities that generate steady income and have even allowed for modest savings. Sarvam gave a total of Rs.2 lakhs to 79 people for their economic development/income-generation activities. Cancer Awareness Camp: A cancer awareness camp was conducted by Sarvam in which 100 women participated. The camp focused on the risks of uterus and breast cancer and important precautions that the women can take. Their doubts were cleared about regular testing and other myths regarding the disease. Day Excursion: Sarvam organized a day trip for over 500 women from the village to visit the Velankanni Church. They gave priority to the more vulnerable women in the group, revealing again the growing sense of compassion and fairness within the village. The women came together from all castes and walks of life and spent the day together in harmony and good cheer. Games and Cultural Activities: Sarvam organized games and skill-building activities for the women to serve as an opportunity for them to work, play and socialize together while building their creativity, skills and physical strength. Over 700 women contributed to a community saving fund to sponsor these types of activities in the future. Kolam Competition: A rangoli making competition was organized this summer with 60 women from all the four villages with scheduled, backward and most backward castes members competing against each other, socializing perfectly well. Even the scheduled caste women, who usually do not try very hard participated fully and sought to create the most beautiful kolams possible. Painting Workshop: This summer, Sarvam organized a workshop for 60 women who used brushes for the first time. The outcome was exceptional, and realizing that the talent exists, a possible goal is for the women to earn money by painting saris and dresses. Cooking Competition: Nearly 75 women participated from different castes and everyone had a good time. Guidance for Mothers: Premila Tamizhvanan, a trainer with the World Health Organization held a session for over 100 mothers of adolescents in the programme. The goal was to help the mothers understand how to work with and support their adolescent children, especially the girls, who are going through a very difficult and confusing phase of life. Inspirational visit to Madurai: Over the second weekend in March, 22 women from seven different hamlets in the Poothurai panchayat spent three days visiting the Aravind Eye Hospital and related projects in Madurai. Unlike previous trips to the hospital, most of these participants were led by women and not by Sarvam coordinators. They had an opportunity to see other women who overcame obstacles and succeeded in building a meaningful life. Observing women from similar circumstances building viable income-generation opportunities helped give them the perspective and confidence to do the same in their home villages. Tailoring Program Funded by Loomba Foundation: Sarvam started a tailoring training for 100 women, sponsored by the Loomba Foundation. The Foundation has pledged 100 machines, out of which they initially provided 16 machines for training. The groups of women from different villages and castes are coming together for this training. The goal is for the women to be able to provide local sewing services as well as possible income generation through outsourcing from other companies. The overall change in the attitude of people is especially evident and all-pervading in the youth of the villages. There is a visible diversion of energy from their erstwhile errant and aimless ways to the present significant contributions to community and self-development. There is a lot of initiative and participation in voluntary activities for the community, a major one being organizing and managing the village journal Grama Pudiya Udayam in Tamil, the local language. They have also undertaken the clearing of a piece of land to be used as a playground in a hamlet. The reformed youth regularly participate in progressive discussions on the psychological and social issues concerning their lives and their future. In the last six months, the circulation has grown to 900, of which 600 are paid annual subscriptions. It is a matter of pride and dignity to have a journal of their own which talks of their problems, issues, joys and sorrows. The Programme continues to inspire and generate a sense of purpose in the village youth. The Integral Village Development Programme gives special support to the welfare of the vulnerable and marginalized sections of the community, including the aged, destitute, sick and widows through moral support, counselling and financial assistance. Periodic health check-ups and necessary medical help are arranged. The Programme also extends small loans for economic development of this section of the society. Livelihood programs: Many elderly women and widows are unable to be employed for physical labour. 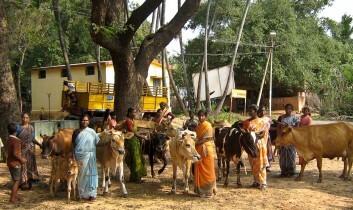 Sarvam has encouraged and supported these women to start raising goats. This has provided them with a small income and a sense of purpose. They were also helped to begin rearing cattle by providing loans, training and encouragement. This provides them with a steady income that would not have been possible without this aid. With Sarvam’s help, over 100 marginalized people have started saving money through a pooled community fund. Workshop for marginalized: A one-day workshop was conducted for the vulnerable population, especially the widowed. Due to the treatment meted out to them, they are people with a lot of negative thoughts and often do not take care of themselves. Sarvam has done activities for the vulnerable before, but found that their mind set was holding them back. This workshop was conducted to get them take charge of their lives and they get involved in some economic activities. As has been Sarvam’s practice, the coordinators insisted on co-mingling the castes in the workshop. And it is especially difficult for the older widows who are dealing with tremendous isolation, stress and emotions. While it was challenging to them, it worked out well, and were happy to have done this together. In the end, the workshop was very successful and greatly appreciated. In the model hamlet of Manaveli, the Programme has helped build a community centre, named Satyam, as a venue for social functions, community meetings and similar village activities and gatherings. Prior to Satyam, people of the village had to reach out to other hamlets for community space, spending a lot of money for social events, wherein even the important meetings were held under a tree.